1 Commercial Street, the Provincetown Inn (1930s), courtesy of the Provincetown Inn. Mural by Don Aikens (ca 1966), 1 Commercial Street, by David W. Dunlap (2009). Swimming pool (not yet cleaned for the summer), 1 Commercial Street, by David W. Dunlap (2010). A redecoration begun in 1966 yielded charming murals by Don Aikens, based on old postcards and vintage photos. The most ambitious suite, in the Tiffany Room, recreates the Long Point settlement. 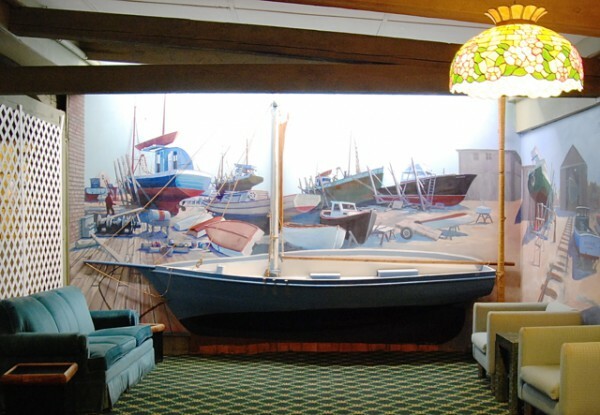 Aikens also created “three-dimensional murals” with elements like a sawed-apart boat hull (pictured) to give them actual depth. Peck sold the business in 1972 to a group of investors from whom Brooke Evans emerged as the owner in 1977. The pavilion was demolished in 1997. The Evans family still runs the inn. Evan, Brooke’s son, is the hotel manager and president of the Provincetown Inn Cooperative. More than 2,000 buildings and vessels are searchable on buildingprovincetown.com. The Building Provincetown book is available for purchase ($20) at Town Hall, Office of the Town Clerk, 260 Commercial Street, Provincetown 02657. 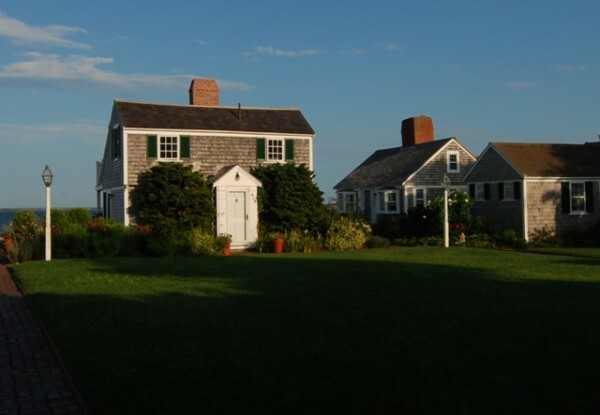 Commanding a view as far as Wellfleet, the Louis Hollingsworth home was known as the Castle or Castle Dune; also as Pilgrims’ Landing (still visible on the gateposts). It was next owned by George Paine. Anton von Dereck had an art metal studio here. 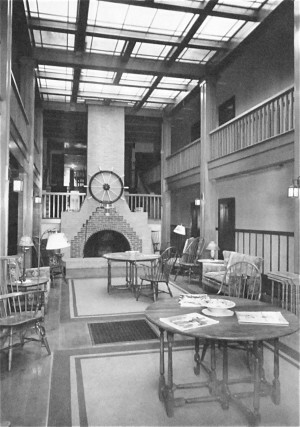 In 1936, the property was bought by Dr. Carl Murchison, a well-known psychologist at Clark University. He and his wife, Dorothea, collected works by artists connected with the town. Ross Moffett estimated there were 250 paintings and 150 prints and other works. Almost all were lost in 1956, when the house burned down. 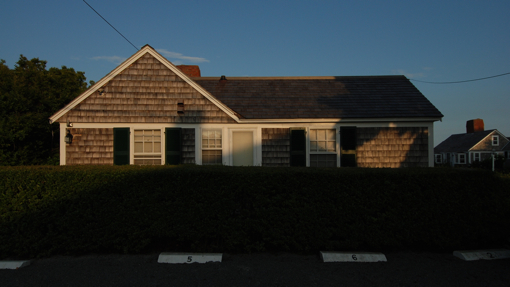 The Murchisons, vowing to rebuild, created Provincetown’s most distinctive work of mid-century modernism. 2 Commercial Street, by David W. Dunlap (2009). Commanding a view to Wellfleet, Castle Dune (or simply, the Castle) was purchased in 1936 by Dr. Carl Murchison, a renowned psychologist at Clark University. He and his wife, Dorothea, collected works by American artists, especially those connected with the town. Almost all were lost in 1956, when the house burned. In rebuilding three years later, the Murchisons created the town’s landmark of mid-century Modernism, a hilltop promontory inspired by Japanese temples and designed by TAC, The Architects Collaborative of Cambridge. A core for sleeping and dining is wrapped in glass and verandas, for sweeping views of land and sea. It’s frequently referred to as the “Gropius house,” because the most famous of TAC’s eight partners, Walter Gropius, worked with Murchison on concepts, then collaborated with Robert McMillan and Benjamin Thompson. Furnishings by Hans Wegner and Kaj Franck came from Design Research, or D|R, founded by Thompson as a service for TAC clients. 2 Commercial Street, by David W. Dunlap (2010). 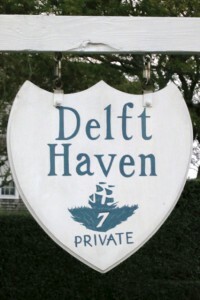 7 Commercial Street, Delt Haven, by David W. Dunlap (2010). 7 Commercial Street, by David W. Dunlap (2012). Named for the Pilgrims’ embarkation port in Holland, the pretty cottage colony of Delft Haven was begun around 1934 by Ralph Carpenter, retired general manager of the Caribbean Sugar Company of Manopia, Cuba, who lived at 11 Commercial. Carpenter was among the first hosts to offer amenities like full bathrooms. An early brochure said patronage was “restricted.” That probably meant Jews were unwelcome, though Carpenter would have gladly excluded homosexuals, too. Delft Haven sits astride the road, with compounds at No. 7 and No. 10. Under the ownership of Peter Boyle, it became an early condo association, in 1977. (Bayberry Bend, 910 Commercial, was the first.) Delft Haven was the setting of the annual White Party starting in the 1980s when Ken Kruse and Don Cote lived there. White costumes only; anything else goes. Had he lived to see the day, Carpenter would have turned white as a ghost.